Richard Mullins is pictured with two nice gobblers he killed during a recent hunting trip to Florida with columnist Steve Brewer. Turkey season is off and running. I took four of my friends to Florida recently to finish their “Grand Slams” or just to hunt at the Watermelon Pond Plantation. 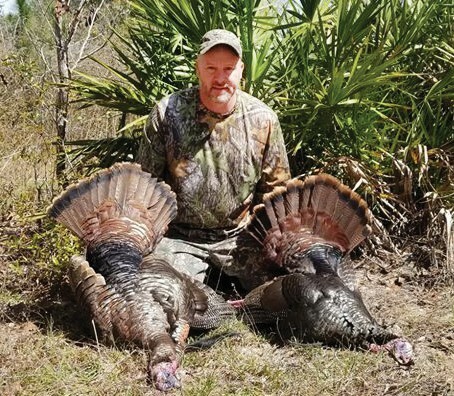 My friends from Illinois, Rhett Rossi and Jamie Malcom, were both after their “Slams.” Rhett got his the first day, a nice long beard with 10 inches hanging, and one and one-quarter inch spurs. He was in a state of panic for months, although I told him everything would be fine. Jamie passed on a group of Jakes and missed a nice old Tom. He will try again next year. My second biggest thrill this year was the fact my Letcher County friend, Richard Mullins, went. We had a great time, whether it was out eating and just enjoying what hunting is all about. He got two giant gobblers and was finished before 11 am. I have sent his picture to Ben Gish so he can put it with this story. I would hope more of you would take advantage of my world of knowledge about places to hunt and go. My biggest thrill though was my youngest daughter, Nema Brewer-Candy, getting her first wild boar — with a knife — in the swamps of Florida. I was so proud of her, and to see the smiles on her face will be with me a life time. Father and daughter Steve Brewer and Nema Brewer-Candy were happy after Ms. Brewer-Candy killed a wild boar in Florida. 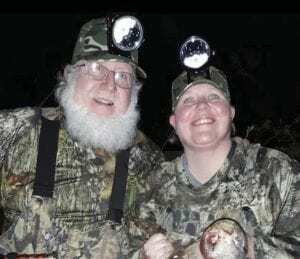 I want to thank my friends in Florida — Ms. Kate, owner of the Watermelon Pond Plantation, who has allowed me to hunt with her since 2004, and Jay Hucklebee, our guide. Both do a great job.